Saved Replies are a great time saving feature. They speed up your response times and allow your team to provide consistent answers to common live chat questions. You might know them as quick replies, canned response, or macros in other tools. 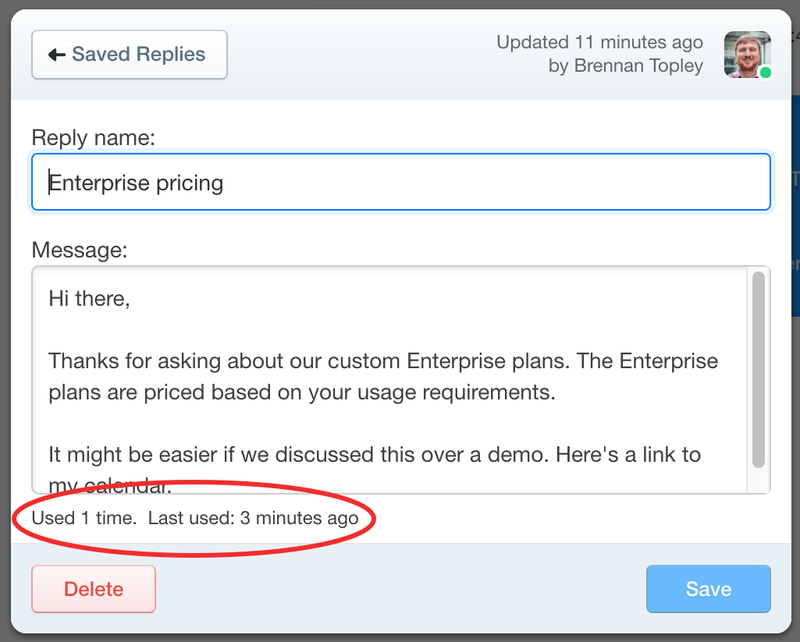 Everybody on your team can create, edit, delete, and send saved replies. Just click the Saved Replies button whilst you're chatting with somebody and click the one you need. If you want to, you can then customise the reply before hitting the send button. You can see when a saved reply was last used and how many times in total it's been sent. Just find the reply you want and hit the Edit button. Just can hit the # key to bring up a list of your existing saved replies. You can either start typing to search the list, or use the up and down arrows on your keyboard to find the one you want. Then press Enter to select it.